I was going to write a review for the Tarte PRO Glitter Liner in Rose Gold, however, I don't think a review is needed since it is a limited edition. And after all, it is not a product where you will be constantly purchase. This is a hype product. You won't be missing out anything if you don't get it. But if you intent to buy it, I would like you to know that you can do a lot with this eyeliner (other than just eyelining your eyes). Available at Sephora. It is limited edition. Priced at RM105. Also comes in silver and gold. This product functions as a typical eyeliner. As an eyeliner by itself, the color is not as pigmented as the usual eyeliner. and the brush creates streaked line. Perhaps you can change to a flat brush instead of using the pointy brush that comes in the tube. The glitter side is almost impossible to use as eyeliner because the glitters are quite sparse. 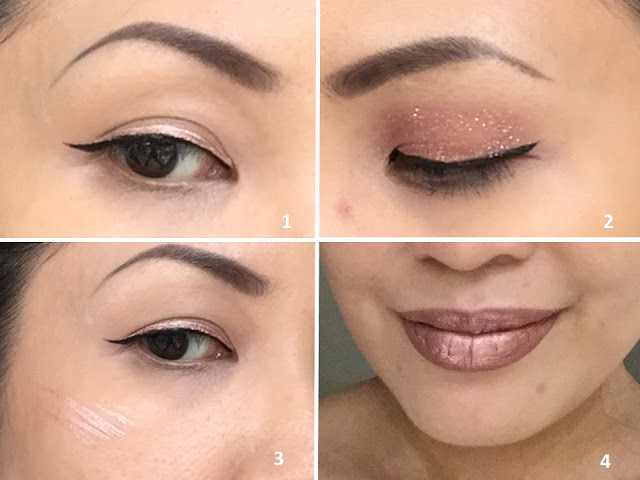 Use your fingers to dab the glitters onto your eyelid. To add more dense to the glitters, repeat the step. You can turn any of you matte eyeshadow into a shimmer one with this. Use the metallic part as highlighter. You can either use your fingers to get the product out of the brush then dab it onto your skin on the areas you want to highlight. Or you can draw some streak lines then blend it out with your finger. If you don't use highlighter often, why not save some money and use this to double up the value of your makeup product. Apply on top of your lipstick using dabbing motion with your fingers with the metallic liner and you will get a beautiful lip topper. Since metallic lip topper is trending now, you don't have to get a new lip topper if you have this to do the same. Lastly, I love to use the metallic liner as special effect makeups. It is so apt for the Coachella festival makeup trend. I use it to create fake freckles and use the glitter part as smaller particles. If you're creative enough, you can use this to draw a lot of other motifs. If you ask me if you should buy this Tarte PRO Glitter Liner, I would say I have no comment. It really depends what you use it for. The liner isn't as good as I expected because the metallic part is pretty streaky and the glitter isn't as dense as I wish. Overall, I think it is a pretty product to have but it is not a necessary product. I will leave it up to you to decide.